The 2018 Queen's Club tennis championships has been one of the most compelling in years. The annual curtain raiser before Wimbledon, this year's grass-court tournament has seen the return of Andy Murray, some Nick Kyrgios antics and a fantastic field that has culminated in a grandstand Queen's final of Marin Cilic vs Novak Djokovic. This year Queen's, which is held at the Queen's Club in West Kensington, London will run from Monday June 18 to Sunday June 24. 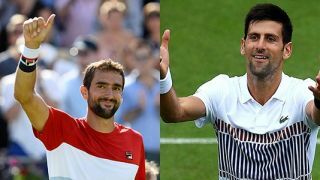 The Cilic vs Djokovic final is set to start at 2.30pm BST, 9.30am ET, 6.30am, 11.30pm AEST. And because the good old BBC is showing the best of the action, you can stream Queen's Club 2018 live from practically anywhere on Earth. This year the official name for Queen's is the Fever-Tree Championships which, like every year, runs two weeks before Wimbledon starts. Queen's Club is the men's ATP tennis tournament that runs each year ahead of Wimbledon in England. The Queen's tennis championship can be traced back to 1884 but it actually began at the current location in 1890, where its has been played for the 128 years since. So if you want to catch all the action live, read on to find out the best way you can do exactly that from wherever you are. And the best bit? It's absolutely FREE! This year Queen's tennis 2018 will be aired on the BBC Two live, meaning it's free for anyone to watch via TV, the BBC iPlayer app or a TV player online. Alternatively, if you're watching online, we'd heartily recommend TVPlayer.com, which offers a host of channels with a high quality stream. Coverage of the final will start at 2.30PM BST. Simply open the VPN app, hit 'choose location' and select the appropriate location - it's super easy to do. Choose UK to stream Queen's tennis 2018 live for free (use the links below). The TVPlayer service is free and the best legal way to stream all of the action at this year's Queen's tennis 2018 live. Once your VPN is up and running with a UK location, simply head to TVPlayer.com. Where can I watch Queen's tennis 2018 using a VPN? A VPN will enable you to watch Queen's tennis 2018 from literally anywhere. So that obviously includes: the United States, France, Russia, Spain, Japan, Italy, Poland, Germany, Mexico, New Zealand, Czech Republic, Ireland, Austria, Thailand, Canada, Australia, Denmark, China, South Africa, Argentina, Singapore, Turkey and more!